Cylinder bed shape for easy operation and insertion of collarette band straps. Rimoldi 264-12 2 mu-01 Single needle high speed Chain-stitch sewing machine. Side knife binder Top & bottom feed version nice condition, hard to find second hand. Serviced and tested before despatch. Rimoldi 264-12 2MQ-01 Single needle high speed Chainstitch binding sewing machine. Expensive when new, in good condition serviced with warranty. including auto reverse and auto foot lifter assembly. 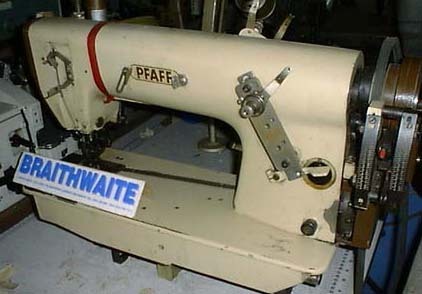 Complete with matching unit stand and heavy duty 3 phase Pfaff/quick needle position motor.